The purpose of this project is to set up a cell-free protein synthesis (CFPS) resource based at Norwich BioScience Institutes in collaboration with University of Cambridge. Cell-free protein synthesis (CFPS) has emerged as a powerful technique for on-demand, in vitro protein production which reduces labour and increases experimental throughput. However, cell-free systems can be laborious and expensive to set up and there is a shortage of publicly available data comparing different CFPS systems, particularly regarding plant proteins which can be difficult to express. This proposal will provide a resource for researchers to prototype their experimental plans without setting up the system themselves. We propose comparing an in-house generated E. coli S30 crude lysate system with a commercial wheat germ platform to quantify their ability to synthesize transcription factors and other plant proteins. This will provide data that can be used to build a simple model to predict which CFPS platform is best suited to a researcher’s needs. Additionally, two workshops (at Norwich and Cambridge) will communicate these results and provide additional expression data by crowdsourcing DNA assembly to workshop participants. The purpose of this project is to set up a cell-free protein synthesis (CFPS) resource based at Norwich BioScience Institutes in collaboration with University of Cambridge. While there is growing interest in cell-free systems as a means for accelerating biological research, there is a higher barrier in terms of cost (£) and knowledge to setting up CFPS. Indeed, there is a shortage of publicly available information comparing the cost, yield, and flexibility of different CFPS systems. The limited data available often uses standardized non-plant reporter proteins such as green fluorescent protein (GFP) or luciferase which complicates comparison for plant biologists since plant proteins may require unique additives or an optimized folding environment for robust, soluble expression (Supplementary Figure 1 in proposal). This proposal aims to fill this knowledge gap by comparing a low-cost, in-house PANOx-SP E. coli S30 CFPS platform3 with a commercially available wheat germ4 CFPS kit from Promega. Cell-free protein synthesis (CFPS) has emerged as a powerful technique for on-demand, in vitro protein production which reduces labour and increases experimental throughput. However, cell-free systems can be laborious and expensive to set up and there is a shortage of publicly available data comparing different CFPS systems, particularly regarding plant proteins which can be difficult to express. In this project, we developed a resource for researchers to prototype their experimental plans without setting up the system themselves. We compared an in-house generated E. coli S30 crude lysate system with a commercial wheat germ platform to quantify their ability to synthesize transcription factors and other plant proteins. This will provide data that can informwhich CFPS platform is best suited to a researcher’s needs. We held multiple workshops in Norwich and Cambridge to communicate these results and engaged with 20 participants and crowdsourced DNA assembly to 9 workshop participants who tested a gene useful their own research. Outcome #1: CFPS expression vectors pJL1 and pF3 WG (BYDV) Flexi® will be modified to be compatible with Type IIS-based restriction cloning (Golden Gate, MoClo, Loop, etc). 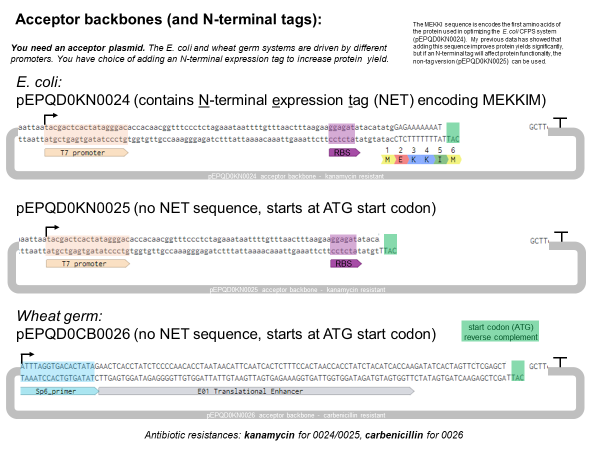 Standardized backbones will be available through Addgene (if possible). Completed: Expression vectors were successfully assembled and used for cell-free expression. Three backbone vectors are available: pEPQD0KN0024 and pEPQD0KN0025 for the E. coli system and pEPQD0CB0026 for the wheat germ system. Due to availability, the pEU vector (Addgene #53738) was used in place of the pF3 plasmid. Four C-terminal tags were also cloned into Level 0 vectors (pEPQD0CM0027- pEPQD0CM0030) for detection of expressed proteins. In progress: Plasmids will be uploaded to Addgene upon publication of protein expression results. Completed: In coordination with Susan Duncan, we expanded the scope of the project to test 42 transcription factors (TFs) in cell-free expression. 39 were successfully were synthesized by Twist Bioscience into an E. coli CFPS-compatible vector. 37 were tested in the E. coli CFPS system; 11 of 37 successfully expressed. pSD0KN06 was purified by Strep-beads and it appears there is sufficient protein for the DAP-seq protocol. In progress: DNA assembly for wheat germ plasmids is ongoing; we expect to compare all 39 proteins in the coming months. Outcome #3: Publication of a computational model incorporating a publicly available web interface for comparing and predicting cost of plant protein CFPS (Nicolas Larus-Stone, UC). Completed: Preliminary data for protein expression of wheat transcription factors (Objective 2) and other proteins (Objective 4) is 80% complete. In progress: Unfortunately, with the delays in collecting expression data, Nicholas Larus-Stone has completed his master’s thesis and is unavailable to continue development a computational model. In response, we are planning a short paper summarizing these results to be published in an open-access journal. Outcome #4: Two hands-on workshops (at Norwich and Cambridge) will allow attendees to run and quantify a protein with the option of providing a DNA template of their own choosing. Completed: Three workshops were completed with 9 participants who cloned and expressed proteins of interest to their research (8 Norwich, 1 Cambridge) along with 11 observer participants who expressed GFP as part of the workshop (2 Norwich, 9 Cambridge). Explore possibility of generating lysate from BY2 tobacco cells in which vacuoles are removed from the protoplasts (unknown cost, need to obtain access to a nitrogen mini-bomb for lysis). This aim does not have a timeline or funding allocated at this time. Participants in the Cambridge workshops.